In its second season, New York Textile Month put on by Parsons School of Design and Lidewij Edelkoort is a month-long city-wide festival designed to celebrate textile creativity and promote textile awareness. Initiated by Lidewij Edelkoort, trend forecaster and Dean of Hybrid Studies at The New School and assisted by Willem Schenk, this multiple-location event gathers all voices and expressions concerning textiles, bringing together museums, galleries, showrooms, retailers, design studio, students and the general public. MORDANT, hosted by textile artist and teacher Victoria Manganiello and NYC-based filmmaker and cinematographer Kristin Kremers, is part of this celebration. 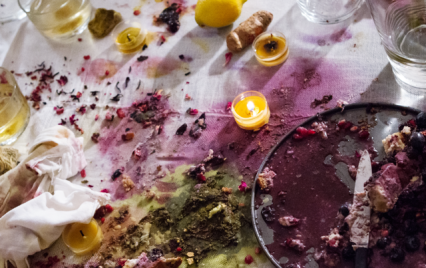 An examination and documentation of our relationship to textiles by using a tablecloth as a canvas, MORDANT features a dinner, cooked by artist Victoria Manganiello, that will be served directly on a table cloth she wove by hand. Recipes and ingredients have been chosen with direct consideration to the potential of dying that cloth and the meal will be served in such a way that the food will inevitably meet the cloth. MORDANT asks participants to join in the process of connecting fiber with dye; an integral part of Manganiello‘s artistic process. We caught up with Manganiello to ask a few questions about MORDANT. When we think about the food and fiber crossover, it almost ALWAYS goes to natural dye projects. Talk about how MORDANT is more than just a natural dye event. Another important part of the food and fiber crossover is its ubiquitousness. Fibers have been given color from food for thousands of years and by people across the globe. Before the invention of synthetic dyes, a short 161 years ago, all of our colors came from natural resources including food items. My guests at Mordant will be connecting food with fiber in the subtle ways that are a part of the regular ritual of eating dinner but their actions will be exaggerated because of the way the food is served to them. Think bowls made from infused ice, slotted spoons and bread plates. I’m serving them a home cooked meal in such a way that they won’t be able to avoid creating color while creating connections both present and past at the same time. I’d like to highlight our shared relationship with color and I hope my guests find the curious experience of leaving a mark upon a handwoven cloth to be an insight into the ways common objects (like cloth) are and have always been produced and embellished.